Somewhere under the undulating Pacific Ocean, two to three miles off the coast of Point Reyes, is the airplane Army Pvt. Clint Eastwood was aboard when the pilot ditched it in 1951. Now more than 66 years later, the search is on for the aircraft that was part of a real-life drama for Eastwood, long before he would become a Hollywood star. “What was going through my mind was just a stark fear, a stark terror, because (in the) first place, I didn’t know anything about aviation at that particular time — I was just hopping a ride,” the actor said in 2015, recalling the incident in which the pilot also survived. The future actor and director — 21 at the time — was en route back to Fort Ord after visiting his parents in Seattle when the Navy bomber he was on crashed into rough seas. The incident, which was reported in a front-page story by the Independent Journal, occurred on Sept. 30, 1951, and has caught the interest of Walt Holm, who works with Berkley-based Open ROV, which builds and operates underwater drones. He wants to find the wreck and has started posting archaeological information on National Geographic’s Open Explorer site, which promotes expeditions. According to an account posted by Holm, two Navy AD-1 Skyraiders left Naval Air Station Seattle for a routine flight to Mather Field in Sacramento. But one of the planes had radio problems, got separated from the other in bad weather and then got lost. While the pilot eventually managed to get into clear weather, he ran out of fuel while flying down the California coast and had to ditch at about 6:25 p.m., putting Eastwood in a life or death situation off Point Reyes. Part of the reason for posting the project on Open Explorer is educational, Holm said. There were several accounts of the incident, which makes it difficult to pinpoint the crash site, Holm noted. Holm will utilize a side scan sonar device, which is adept at picking up obstructions on the ocean floor and often used in the shipping industry. The airplane could be as deep as 200 feet below the water’s surface, he said. James Delgado, the retired director of maritime heritage for the National Oceanic and Atmospheric Administration’s Office of National Marine Sanctuaries, looked for the Eastwood plane as part of larger search of aircraft and shipwrecks between 2013 and 2016. 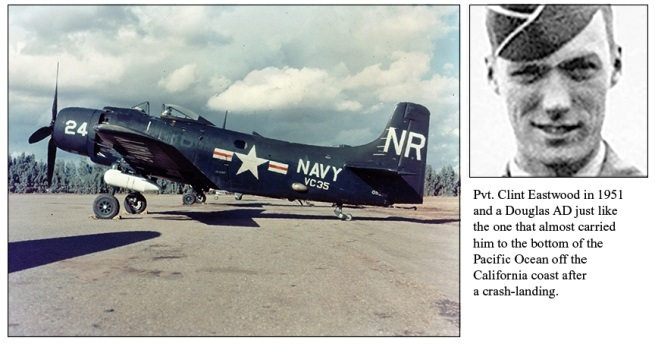 While not historically significant, the Eastwood airplane search draws attention to the larger effort of finding craft that have been lost at sea, incidents which also had a human toll in many cases. “It highlights the importance of finding everything out there, and in many cases, it helps bring closure for families,” Delgado said. Two servicemen, who battled a thick gray fog and a strong surf for almost an hour last night following a plane landing in the ocean near the Marin shore, are returning to their service units today uninjured. Army Pvt. Clinton Eastwood, who wandered into the RCA radio station at Point Reyes after struggling in the ocean, told radio operators he and the pilot were forced to land their AD-2 bomber in the ocean and left on life rafts. Eastwood said he was returning to Ford Ord from his house in Seattle when the mishap occurred. The pilot, Naval Lt. F.C. 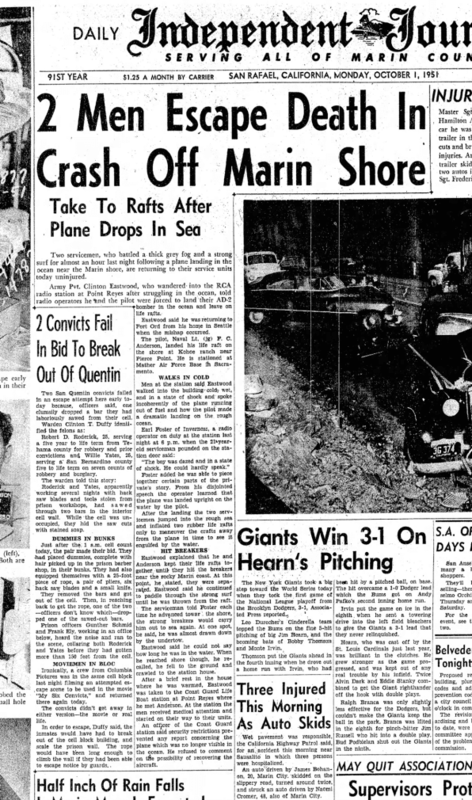 Anderson, landed his life raft on the shore at Kehoe Ranch near Pierce Point. He is stationed at Mather Air Force Base in Sacramento. Men at the station said Eastwood walked into the building cold, wet and in a state of shock and spoke incoherently of the plane running out of fuel and how the pilot made a dramatic landing on the rough ocean. Foster added he was able to piece together certain parts of the private’s story. From his disjointed speech the operator learned that the plane was landed upright on the water by the pilot. After the landing the two servicemen jumped into the rough sea and inflated two rubber life rafts only to maneuver the crafts away from the plane in time to see it engulfed by the water. Eastwood explained that he and Anderson kept their life rafts together until they hit the breakers near the rocky Marin coast. At this point, he stated, they were separated. Eastwood said he continued to paddle through the strong surf until he was thrown from the raft. The serviceman told Foster each time he advanced toward the shore, the strong breakers would carry him out to sea again. At one spot, he said, he was almost drawn down by the undertow. Eastwood said he could not say how long he was in the water. When he reached shore though, he recalled, he fell to the ground and crawled to the station house. After a brief rest in the house where he was warmed, Eastwood was taken to the Coast Guard Life Boat Station at Point Reyes where he met Anderson. At the station the men received medical attention and started on their way back to their units.